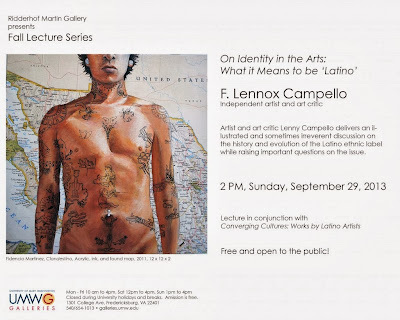 This coming Sunday, September 29, at 2PM I will delivering a lecture titled "On Identity in the Arts: What Does It Mean to be Latino?" at the Ridderhof Martin Gallery at the University of Mary Washington in Fredericksburg, VA. The lecture is free and open to the general public, and from past deliveries of this lecture, I expect that it will continue to be informative, irreverent and eye-opening. Directions to the gallery here.